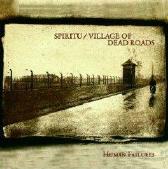 This split album with newcomers Village of Dead Roads and relative veterans Spiritu is notable because, despite the fact that both bands have completely different lineups and different approaches, the end result here could be an album created by one band. The themes, attitudes and atmospheres covered on "Human Failures" are all very similar, despite the fact that Spiritu's tracks are all jammed up front (and are more often a little faster) and Village of Dead Roads all at the back. Crushing doom with stoner guitars, politically charged lyrics and occasional eerie passages that act as dark alleyways between the slabs of pounding sledgehammers of music that make up this CD's eight tracks, "Human Failures" will leave you punch drunk and begging for more. Best of all, "Human Failures" does what all split albums are designed to do. It generates the listener's interest in both bands and will hopefully lead them to seek out both bands other and/or future releases. Judging from the music found on this CD, they're certainly worth looking into. For more information, check out www.meteorcity.com.